Bangkok (Thailand) – December 14, 2018 (travelindex.com) – Praya Dining at Praya Palazzo relaunches with an exquisite culinary journey through time. The cuisine at Praya Dining is curated to showcase the history, opulence of ingredients and culture of each Siamese era from the ancient Kingdom of Sukhothai until today’s prosperous Rattanakosin. With the relaunch of Praya Dining at Praya Palazzo, Montara Hospitality stays true to its mission to re-imagine how lifestyle travelers encounter local heritage. Praya Dining has been reconceptualized to portray Praya Palazzo’s heritage as a century-old Palladian-style river mansion built in the reign of His Majesty King Vajiravudh (Rama VI). Montara’s newest restaurant authentically presents Thai cuisines in manners that enable diners to appreciate the historical context of each dish. By doing so, Praya Dining builds upon the group’s momentum in other culinary destinations. Praya Dining guides diners on a culinary journey through Thai history. Each dish highlights how Thai cuisine evolved during each era throughout history. The journey begins with the Thai relish “Lon” (หลน). Pronounced “lohn” (in Thai meaning to simmer), the relish became prominent during the Sukhothai era. As the first Thai Kingdom, Sukhothai was a time when Thailand was self-sufficient in terms of food, which was cooked at its most simplicity. Served with fresh vegetables, variations of Lon include Salty Mackerel relish or Crab relish. The culinary journey at Praya Dining continues to Ayutthaya era when Thai cuisine was influenced by foreign traders. This era saw the arrival of chili, which has since become the heart of Thai Cuisine, and of exotic spices from which the first curries were born. In addition, during Ayutthaya era, new cooking techniques such as stir-frying, frying and deep frying emerged and are reflected in dishes such as “Koong Sarong” (กุ้งโสร่ง Deep fried prawns wrapped with vermicelli noodles), “Nam Prik Kapi” (น้ำพริกกะปิ Shrimp paste relish with condiments and fresh herbs), “Khanom Jeen Nam Ya Pla” (ขนมจีนน้ำยาปลา Thin rice noodles served with Snake Head fish sauce) or “Massaman Beef curry” (แกงมัสมั่น). Finally, diners at Praya Dining arrive to Rattanakosin era, the current kingdom which established Bangkok as the capital city of Thailand. This era marks the beginning of the Chakri dynasty leading to today’s modern metropolitan city. The period had great influence on Thai food today, from the emergence of street food which was initially influenced by Chinese settlers, to the creation of Thailand’s world-famous noodle dish, ‘Phad Thai’. Throughout the culinary journey at Praya Dining, diners will discover rarefied Thai dishes derived from storied Thai poems, and literatures. The culinary team has researched and prepared the dishes derived from the epic love poem, “Kap Heh Chom Khrueang Khao Wan” (กาพย์เห่ชมเครื่องคาวหวาน), composed by King Rama II, “Tam Ra Kub Khao” (ตำรากับเข้า) by Lady Somjeen, “Khuu Meuu Maae Kruaa” (คู่มือแม่ครัว) by Lor. Phaehtraarat and ‘Chivid nai wang’ (Life in the palace) composed by M.L. Nueang Nilrat. The source materials have inspired the creation of Praya Dining’s signature dishes including “La Tiang” (ล่าเตียง Ancient snack of pork, shrimp and peanuts wrapped in egg mesh), “Sang Wa Kung Pla Duk Fu” (แสร้งว่ากุ้งปลาดุกฟู Roasted shrimp dipping with crispy shredded catfish salad), “Ran Juan Curry” : (แกงรัญจวน Traditional beef soup seasoned with shrimp paste), “Mu Pad Som Siew” (หมูผัดส้มเสี้ยว Stir-fried pork with our forgotten yellow chili pastes recipe) to the dessert like “Bua Loy Look Tarn” (บัวลอยลูกตาล Rice flour balls in coconut milk). 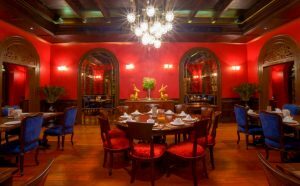 Praya Dining is located in the century-old Italian style river mansion Praya Palazzo. Today a luxury boutique hotel, Praya Palazzo is situated directly on Chao Phraya River and is exclusively accessible only by boat. The mansion’s shuttle boat provides a 24-hour service to and from either the Tha Phra Arthit Pier or Rajathiwas Temple Pier where parking is readily available. Situated on the prominent landmarks along the River of Kings or Chao Phraya River, Praya Palazzo offers guests the opportunity to enjoy history, elegance and river serenity in traditional style all in the heart of Bangkok. Constructed nearly 100 years ago as a private, Thai-Italian style mansion in the reign of His Majesty King Vajiravudh (Rama VI), this boutique hotel, operated by Montara Hospitality Group, provides personalized services to discerning tourists seeking a unique experience in the gentle traditions of a bygone era. Opened since 2012, the recently revamped Praya Palazzo with further extensive renovations along with the relaunch of Praya Dining are done by November 2018. With legendary heritage and architectural beauty, Praya Palazzo was honored with accolades including Prime Minister’s “2014-2015 Thailand Boutique Awards” under “Luxury Thematic River/Lake Hotel” category, and “2011 Architectural Conservation Award” selected by The Association of Siamese Architects under the Royal Patronage of His Majesty the King. As a Thai family, we take pride in sharing our natural and cultural heritage. We want our guests to experience our most sincere and innovative services that will bring them joy. We invest in best-in-class hospitality platforms that connect investors, lifestyle travelers, and innovative hoteliers. Our properties include Phuket’s most exclusive pool villa beach resort Trisara, Bangkok’s only river mansion boutique hotel Praya Palazzo, and the innovative movie house-turn-hotel Prince Theatre Heritage Stay in Bangrak. We developed, own and manage Phuket Island’s most special resort experience “Trisara”, in Sanskrit “The Garden in The Third Heaven”. Wrapped in a tropical forest and exotic gardens, the 60 spacious ocean facing pool villas and 2-7 bedroom private residences all embrace our own quiet bay on Phuket’s sophisticated and natural north-western coastline, just 15 minutes from Phuket Airport. PRU sources ingredients from PRU’s own farm and local purveyor communities of fishermen and farmers for the long-term sustainability as well as “Seafood at Trisara” inspired by authentic Thai family heirloom recipes passed through the generations in which also received the exciting Michelin Plate designation. In late 2017, Praya Palazzo has become a family member of Montara Hospitality group, a century-old Italian style mansion directly on Chao Phraya River in Bangkok, with the newly revamped of the interiors and the restaurant in November 2018. We launched Prince Theatre Heritage Stay in early 2018. Prince Theatre is Bangkok’s only movie house turn boutique hotel. The 26-room, 130-bed property is located at the heart of Bangrak, Bangkok’s renowned street food paradise and creative district. Prince Theatre is the showcase property of Heritage Stay Company, which seeks to re-imagine how travelers connect with Thailand’s rich local heritage and to be a part in supporting the local community.